On February 7, 1964 John Lennon, Paul McCartney, George Harrison and Ringo Starr arrived in America, with their manager Brian Epstein, producer Phil Spector, and other record company dignitaries. It started the ‘British Invasion’ – making room for The Rolling Stones, Herman’s Hermits, The Zombies, Freddy and the Dreamers, The Mersey Sound, The Mods, The Rockers… Beatlemania was born. August 8 – From Me To You/Thank You Girl was released as a single. November – The CBS Morning News ran a five-minute feature on Beatlemania in the UK, and it ran again on December 10, 1963. January 18 – I Want To Hold Your Hand/I Saw Her Standing There released. February 7, 1964 – Pan Am Flight 101 left Heathrow Airport and landed at John F. Kennedy Airport, greeted by several hundred journalists and several thousand fans. Two thousand fans had seen them off. 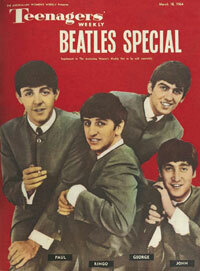 February 9 – Their first televised concert in the U.S. was on the Ed Sullivan Show, on February 9, 1964. 73 million viewers watched that performance, about 1/3 of the population. February 11 – The Beatles performed for 8,000 fans at the Washington (DC) Coliseum. February 12 – 2,000 fans saw them perform at Carnegie Hall, NY. February 16 – The Beatles made their second television appearance on The Ed Sullivan Show. February 22 – An estimated 10,000 fans greeted The Fab Four when they returned to the UK at Heathrow Airport. The Beatles released seven platinum records – in 1964 alone. Introducing… The Beatles, Meet the Beatles!, The Beatles’ Second Album, A Hard Day’s Night, Something New, Beatles for Sale, and Beatles ’65 each sold over one million copies. Also released over the year: My Bonnie, Roll Over Beethoven, All My Loving, Why, Sie Liebt Dich (She Loves You), Ain’t She Sweet, I’ll Cry Instead, I’m Happy Just To Dance With You, Matchbox and Slow Down. July 29 – Help! was released in theaters. *Help! was dedicated to “Elias Howe, who, in 1846, invented the sewing machine”. September 25, 1965 – September 7, 1969 The Beatles cartoon was on ABC. A total of 39 episodes were produced. *Only the opening acts – The Remains, Bobby Hebb, The Cyrkle and The Ronettes performed. 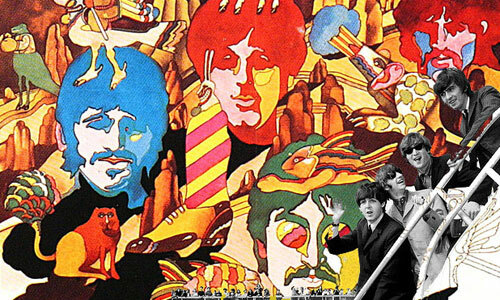 July 17 – ‘Yellow Submarine’ was released in theaters.